Emma in Bromley: Christmas Gift Guide 2015 Part One. I absolutely love Christmas - more so now I have children - so I'm really excited to share with you my Christmas Gift Guide for 2015. Sit back with a hot chocolate and prepare to be inspired and feel a little Christmas joy! Adorable Bigjigs 44 piece Farm Train Set looks brilliant running around the base of the Christmas tree - I've paired the farm set with the Christmas Train available separately. Adorably festive Polar Bear family from Sylvanian Families - Peter, Barbara, Julia and Beth Polar Bear are all set for christmas! Aquabeads are a great gift or even stocking fillers, the range has many different accessory packs so you can really let your imagination go with these - the website also has printable templates too. If you haven't already come across Lottie Dolls- they are award winning dolls for children that reflect a 9 year old in both clothing and anatomy - Lottie comes in a choice of hair and eye colour and skin tones as well as a boy action figure. This one is Autumn Leaves Lottie all wrapped up warm in her winter coat and brown boots. Besides the UK Lottie website, there is now one for EU Lottie too. Great paint by numbers kits by Paul Lamond are perfect for all craft loving children- Rainbow Magic kit creates 3d fairy pictures whilst the Dinosaur Roar kit create 3d dinosaurs. Le Toy Van Budkins Bertie's Red Tractor is a lovely wooden tractor and trailer set that comes complete with Bertie the farmer himself - shown with a Pabo Simmental calf available separately both from Farm Toys Online. Warmies heatable soft toys can all be warmed in the microwave and are infused with the relaxing scent of lavender, Warmies Alfie the dog, Warmies Penguin and Warmies Bagpuss are all nestled together in this handled lined basket from Choice Baskets. The best backpack I've ever come across - this one is the Harry and Jack's Jetpack but they also do a scuba diving one too! Very well made and cleverly thought out, right down to reflective areas, removable wrist strap "control panel for blast off" easy to use zips and drawstrings and plenty of pockets. Perfect for all Adventurers and Explorers. 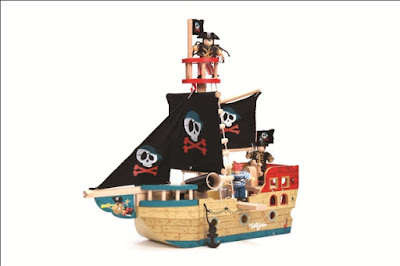 Award Winning TV341 Jolly Pirate Ship by Le Toy Van is a great wooden toy with brilliant details including sails, a plank to walk, a cannon (including two balls to fire) rope ladder up to the crows nest and an anchor to drop are just a few of the imagination sparking features. Really sweet Beatrix Potter Peter Rabbit wooden building blocks from Rainbow Designs are perfect for the smallest people in the family. This Olaf is actually a night light! Philips SoftPal portable Olaf nightlight is squishy and battery operated LED - just tilt him and he remains lit for 5 mins. I always think books make great gifts for children, Have you seen newly published The Person Controller by David Baddiel I'm also loving these classic boxsets The Famous Five collection and My Naughty Little Sister collection from the Works. A celebration of Owl keyrings from Dora Designs in tweeds and traditionally British fabrics, Yankee Candle Winter Glow small candle and the Real Shaving Co toiletries make the perfect stocking fillers for grown ups! Beautiful scented candle by Luxury boutique Lucia Oliver makes a great gift - packaged with care, includes a bow detail lid to protect your candle from dust and presented in a white opaque glass jar - a sublime selection of fragrances are available, I've gone for a festive spiced mandarin, cinnamon and myrrh. Dora Designs Frog and Dog Doorstops are lovely - great details and really well made, they make great gifts. Everyone loves a hamper basket and this one from Choice Baskets is lined. Martha and Hepsie make great wrapping paper such as the penguin wrapping paper featured here and Premier Decorations created the little snow boy peeping through. Stunning glass cake dome and stand from Premier Decorations, beautiful lace detailed powder coated metal stand. Beautiful white metal butterfly lantern by Puji looks great indoors or hung from its loop in the garden. Love this modern Danish take on the babushka - a family of 5 wooden, hand painted nesting penguins from Blue Suntree. Handmade sterling silver Spitfire cufflinks with RAF roundel from the London Silver Company are beautifully made. Plump It volumising lip plumper is one of the current fasted growing beauty products and I'm a fan of it myself! The Personal Barber subscription shaving service offers a starter box including Safety Razor, Brush and wet shave guide, the monthly box will include a selection of blades, balms, soaps, cologne etc tailored to the sophisticated and luxury shaving experience. An array of subscription and gift options are available. Made by Talented Mr Robin bag (Katy Webster) natural cotton canvas tote shopper makes a brilliant sustainable gift. Part Two Christmas Gift Guide 2015 Coming Soon! Thank you thank you thank uuuuuu! I've just managed to do half my Christmas shopping from your gift guide! Result! Cheers Emma!